My dad used to make amazing omelets. He went through a bit of a phase, studying Julia Child’s omelet method, and cooking omelets for all of us on the weekends. His omelets were always filled with one ingredient: sharp Cheddar. To this day, my mom swears she only likes eggs in two forms (weird, I know): hard-boiled and Dad’s omelets. As I sat down to watch the Good Eats omelet episode, I realized that I had never before made an omelet. While I have cooked eggs pretty much every other way, somehow I had never before attempted the omelet. It was time to give it a go. Alton’s omelet recipe begins with heating three eggs in hot water for five minutes; omelets are more tender when they are cooked quickly, and beginning with warm eggs helps this process. Three eggs, warming in hot water for 5 minutes. Crack your warmed eggs into a bowl or large mug, beating them with a fork (Alton says a whisk will add unwanted air). Add 2-3 pinches of salt (not Kosher) and beat some more. Three warmed eggs, cracked into a mug. Ready to beaten, along with some salt. Place a 9-inch nonstick pan over medium-high heat. If you have an infrared thermometer, you will want to heat your pan to 325 degrees. If you do not have an infrared thermometer, heat your pan until butter foams briskly in the pan. Non-stick skillet, heated to 325 degrees. Once your pan is hot, lube the pan with butter, distributing it evenly with a pastry brush. Heated pan, lubed with butter. Pour the eggs into the center of the pan and stir them vigorously with a rubber spatula for five seconds. Eggs poured into pan and stirred. 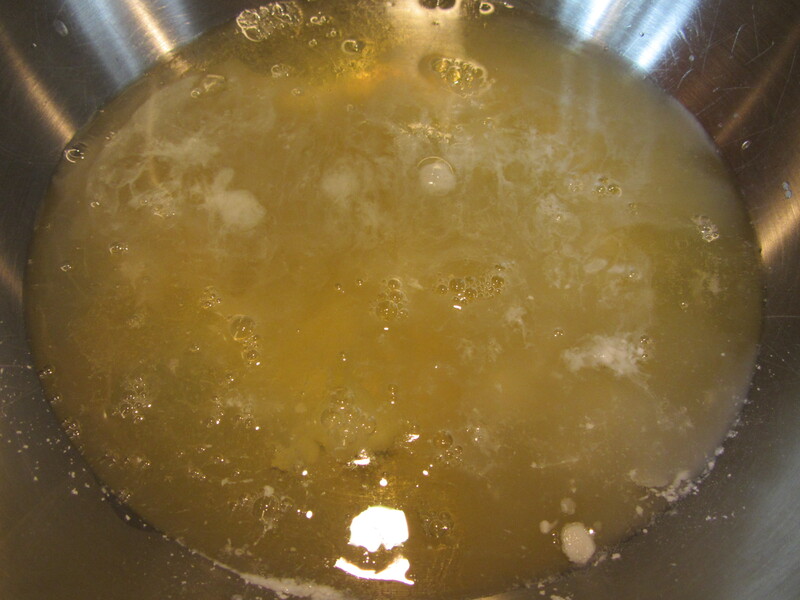 When a mass of curds begins to form, lift and swirl the pan, allowing uncooked egg to flow beneath the omelet edges (Alton calls this the “swirl and sweep” step). Using your spatula, go around the edges of the omelet, loosening them from the pan and forming a nice, round shape. This is when Alton tells you to walk away for a solid 10 seconds, letting the omelet just cook on the burner, but if your eggs are sputtering, turn the heat to medium-low. When your omelet is cooked to your desire (it should still be somewhat wet/soft on the top), jiggle the pan to ensure that the omelet is not sticking. Now it is time to fold the omelet. Lifting up the far edge of the pan, snap the pan back toward you, so the omelet slides toward you. Then, use your spatula to fold 1/3 of the omelet over the center from the side nearest you. 1/3 of omelet folded over center. Finally, change your grip on the pan handle to underhand and slide the omelet onto a buttered plate, letting it flip over itself as it rolls onto the plate. I will be honest that the whole flipping process did not go as easily for me as it did for Alton, but I made it work with a lot of help from my spatula. Add some more butter to your omelet, sprinkle it with some chives, and enjoy! Omelet, flipped onto buttered plate. Chives sprinkled on top for a garnish. This was a good, but very simple omelet. It was light, fluffy, and tender on the inside. Alton’s method made it very easy for me to cook a decent omelet, so this was a great way to learn. I do, however, like to have some extra pizzazz in my omelets, so next time I will add some fillings. When I saw the title for this recipe, I was envisioning a giant omelet. Instead, this is Alton’s method of prepping enough eggs to make several omelets in rapid succession. Oddly, in this recipe, Alton did not warm the eggs as he did for the previous recipe. For this recipe, you will want to allot 5 eggs plus 1 ounce of water for every two people. Place the eggs and water in a blender, adding a heavy pinch of Kosher salt and some fresh herbs, such as basil, dill, parsley, tarragon, or chives (I used basil and parsley). Blend everything together until smooth. Eggs, water, Kosher salt, and fresh herbs in the blender. Meanwhile, heat a 9-inch non-stick pan to 325 degrees (or until butter foams) over medium-high heat. Once hot, lube the pan thoroughly with butter. Using a 4.5 ounce ladle, place one ladle of eggs in the center of the pan and stir briskly for five seconds with a spatula. One 4.5-ounce ladle per omelet into a hot, buttered pan. Next, lift and swirl the pan, letting any loose egg run under the omelet to cook. Let the omelet cook until it is still soft in the center, but set on the bottom, and add any desired fillings (I used Greek olives, spinach, grape tomatoes, and cheese) over the 2/3 of the omelet furthest from you. Fillings added to 2/3 of omelet. Lifting the pan to slide the omelet toward you, use a spatula to flip the 1/3 of the omelet nearest you over the center of the omelet. Change your grip on the pan handle from overhand to underhand, and flip the omelet onto a plate, letting it fold over itself. Omelet, flipped onto a plate. My omelet was definitely not picture perfect, but it tasted good! The method of cooking the omelets in this recipe is the same as for the single omelet above, though this omelet was “dressed up” a little more. I liked the additional flavor of the herbs in the eggs, along with the variety of fillings. This would be a fun/easy way to make customized omelets for a group. If you follow Alton’s method, it is very easy to produce tender, fluffy omelets. Alton’s frittata is last in this episode, and is also the easiest of the three, as there is no fancy flipping involved. For this one, heat your broiler to high and place a 12-inch non-stick skillet on a burner to heat. Once warm, lube the pan with butter and add 1/2 C roasted asparagus and 1/2 C chopped ham. You can use any ingredients you want here, but asparagus and ham were what Alton used. I added some pickled peppers also. Asparagus, ham, and pickled peppers in the buttered pan. Regardless of what you choose to use, you want to have a single layer of filling. While your fillings heat, mix 1 ounce of Parmesan with 6 eggs and 1 t pepper. Six eggs, Parmesan, and pepper. Pour the egg mixture over the fillings, letting it flow between them. Beaten egg mixture poured over fillings. Once the egg starts to firm on top, add some chopped parsley. Parsley added once frittata began to set. Place the frittata under the broiler for 2-4 minutes, or until golden and set; my frittata took only two minutes. Frittata after cooking under the broiler for 2 minutes. Slide the frittata onto a cutting board, cut it into wedges with a pizza cutter, and serve with some sour cream. Frittata, sliced with a pizza cutter. Frittata, sliced with a pizza cutter and served with sour cream. I had made a frittata previously, and this one was very good. The frittata was golden brown on the top, while light and tender in the middle. This would make a super easy weeknight dinner or a great breakfast, and you could customize it to your heart’s desire. It seems odd to write a blog post about a recipe I prepared a mere 10 days ago, while it feels like my entire life has changed since then. Ted went under the knife five days ago to have a massive operation to remove the cancer from his body. He still lies in a hospital bed as I type, and likely will be there for at least a few more days. The excellent news is that they got all of the cancer out and there was zero lymph node involvement. The bad news is that he feels quite miserable. Hopefully he’ll be feeling better soon. Until then, I’ll reminisce about Alton’s angel food cake that we ate 10 days ago. I vaguely remember my mom making angel food cake a few times when I was little, but it was never something we ate regularly. 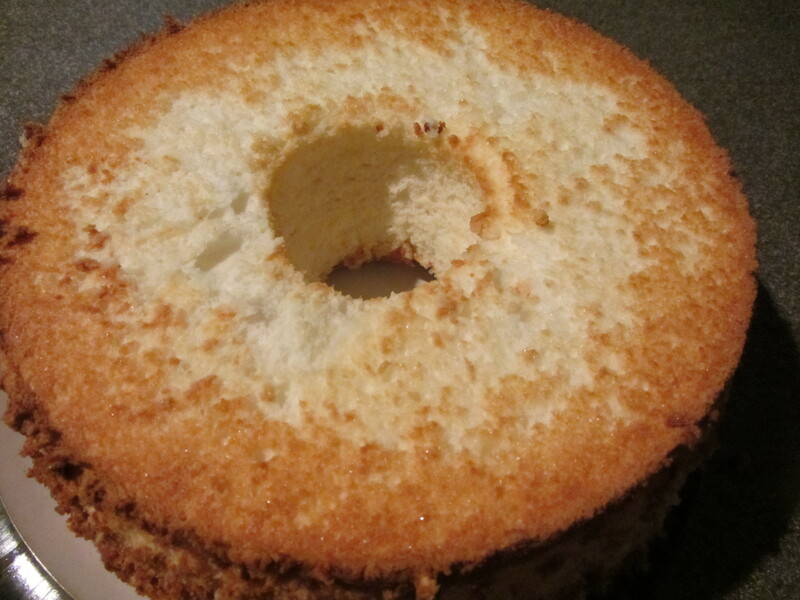 My image of angel food cake has been primarily of the dry, sponge-like, flavorless cakes you can buy in every grocery store bakery in the country. That’s not to say that I dislike those cakes, but just that they don’t wow me. How would Alton’s recipe for angel food cake stack up? 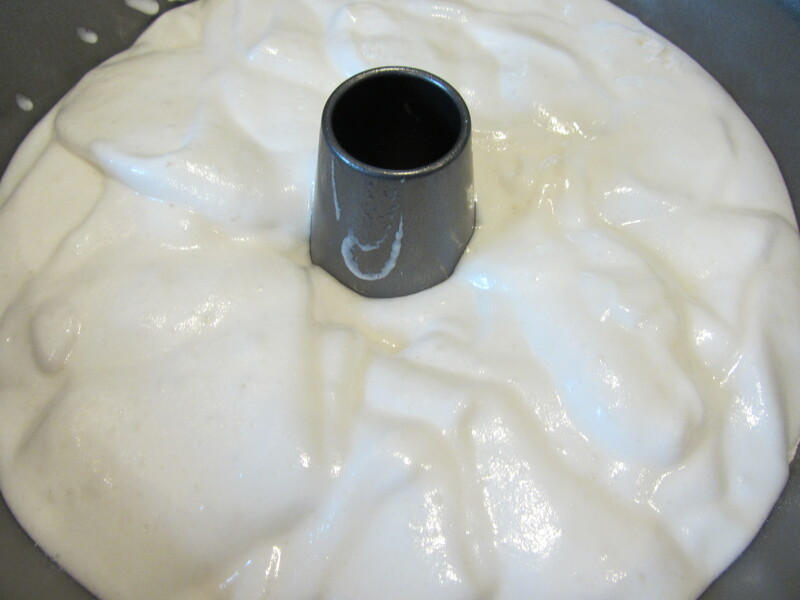 To make Alton’s angel food cake, start by processing 1 3/4 C of sugar in a food processor for two minutes; this will give sugar with finer crystals, yielding between 1 1/4 and 1 1/2 C of sugar. Ingredients for Alton’s angel food cake: cake flour, egg whites, salt, sugar, cream of tartar, and orange extract. 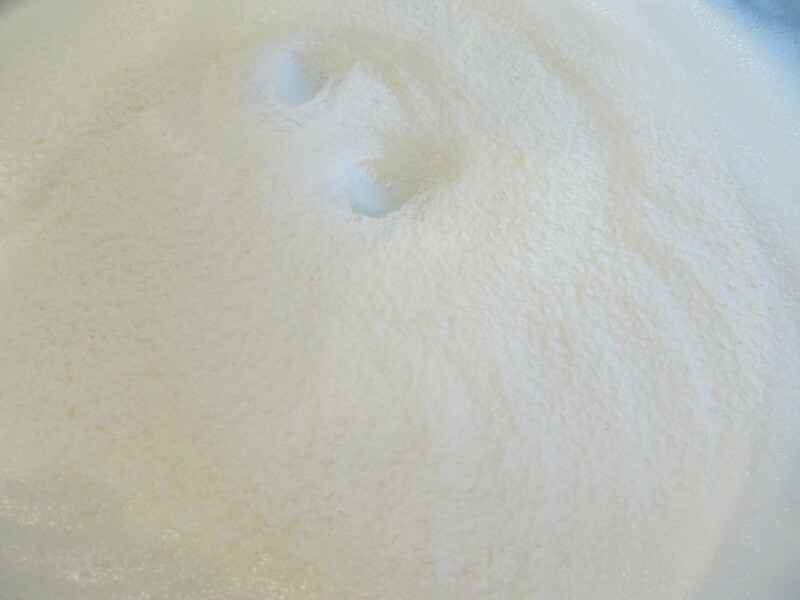 Sugar after processing for two minutes. 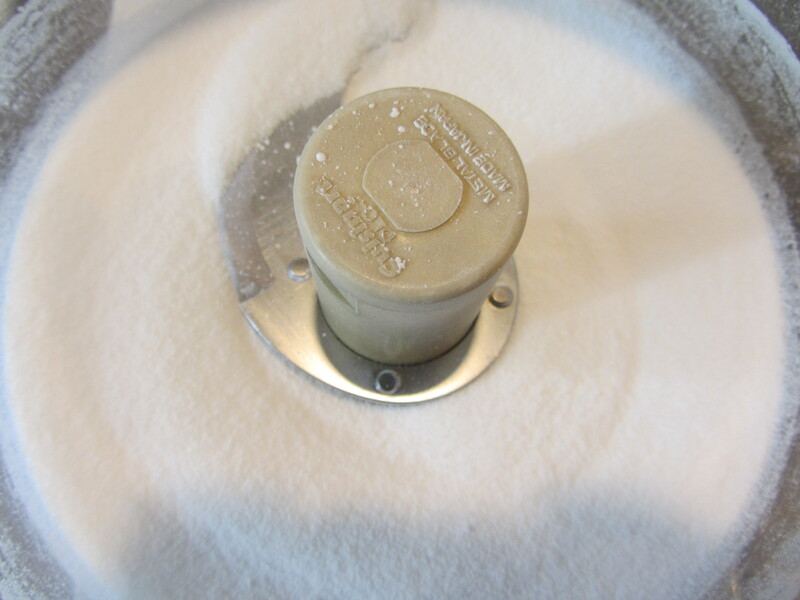 Sift approximately half of this sugar (set the other half aside) with 1/4 t of salt and 1 C of cake flour. 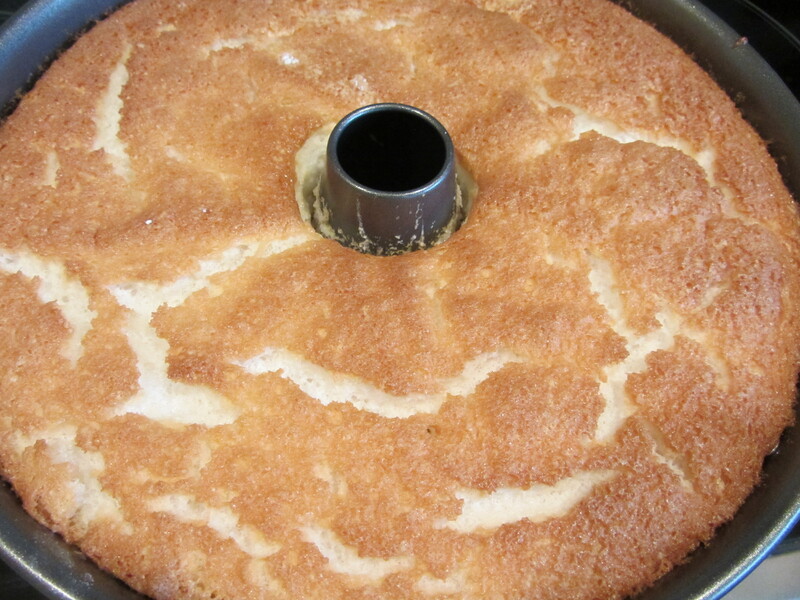 A lot of sugar is needed in angel food cake because there is no fat; the sugar acts as a tenderizer. 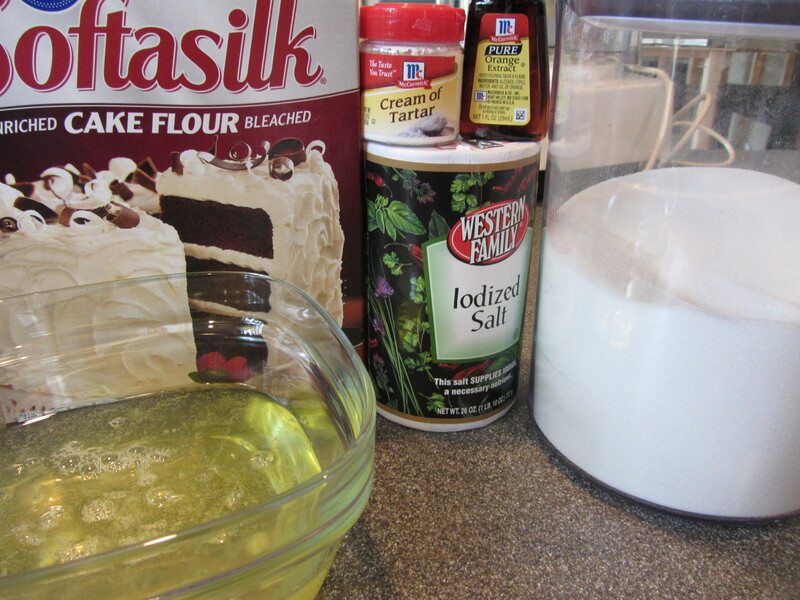 Cake flour is used here because it has no protein, which means no gluten is produced. Half of the sugar sifted with cake flour and salt. Next, you will need a dozen egg whites at room temperature (room temperature egg whites are more flexible, so they foam better). Alton encourages you to separate your eggs using three containers: a container over which you separate each white (to make sure no yolk slips in), a container to contain the yolks, and a container for the yolk-free whites. Why is it so critical to avoid having yolk mixed in with your whites? 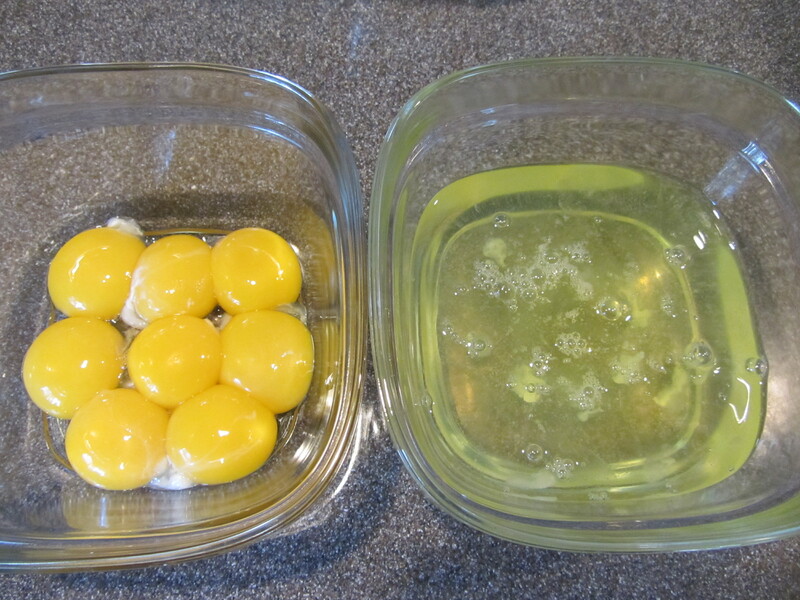 The yolks contain fat, which lubes the bonding points on the proteins in the whites, causing the bubbles to pop. 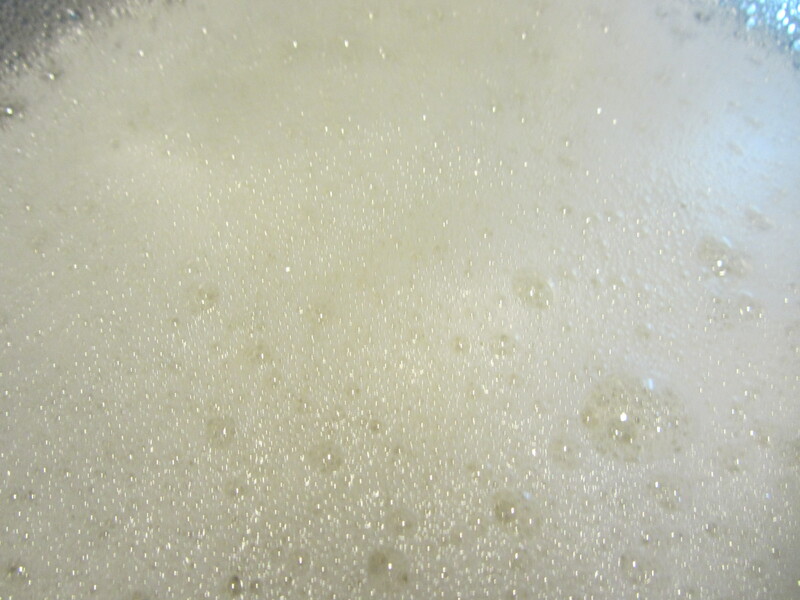 Since angel food cake is a foam, the ultimate goal is bubbles. Once your egg whites are at room temperature, add 1/3 C of warm water, 1 t orange extract, and 1 1/2 t cream of tartar. 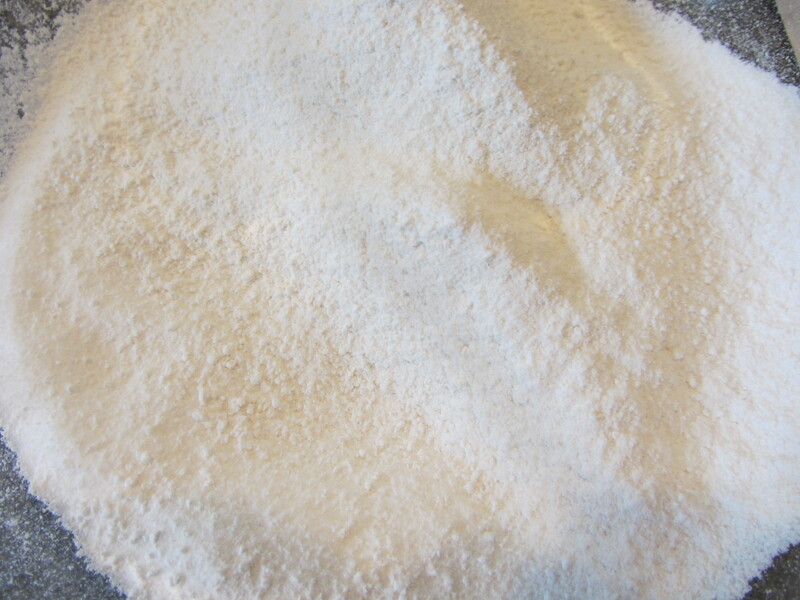 Cream of tartar is a mild acid, made of tartaric acid crystals, that stabilizes foams by adding hydrogen atoms. Egg whites with warm water, orange extract, and cream of tartar added. 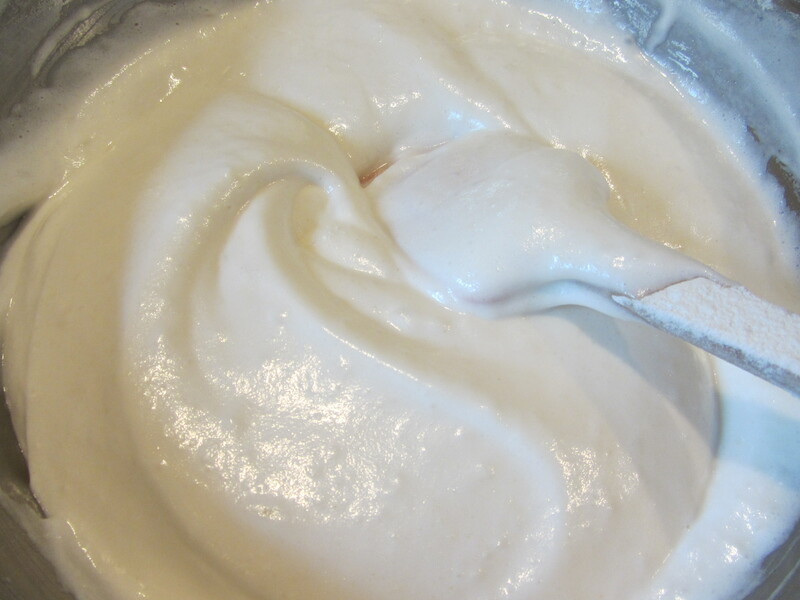 Use a whisk to froth this egg white mixture. Once frothy, whip the whites with a hand mixer on medium speed. Whites beaten with a whisk until frothy. 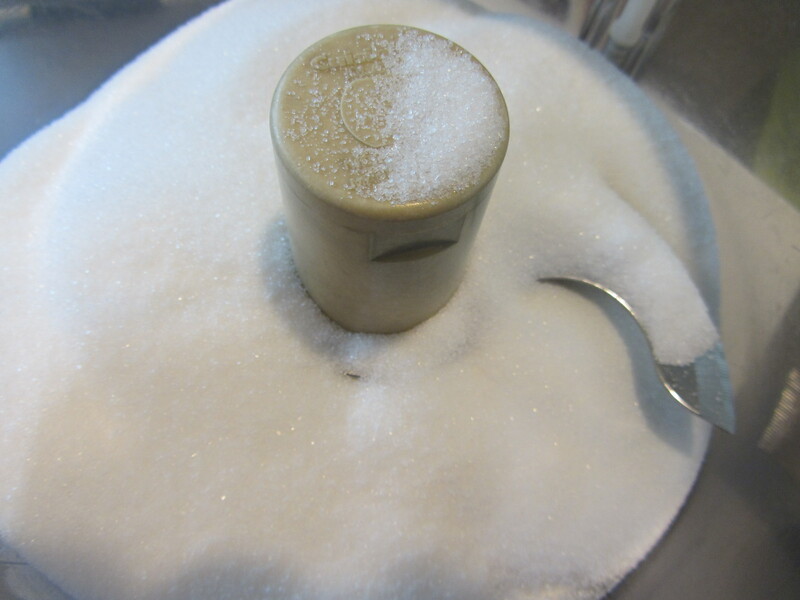 While mixing, slowly add the remaining sugar. 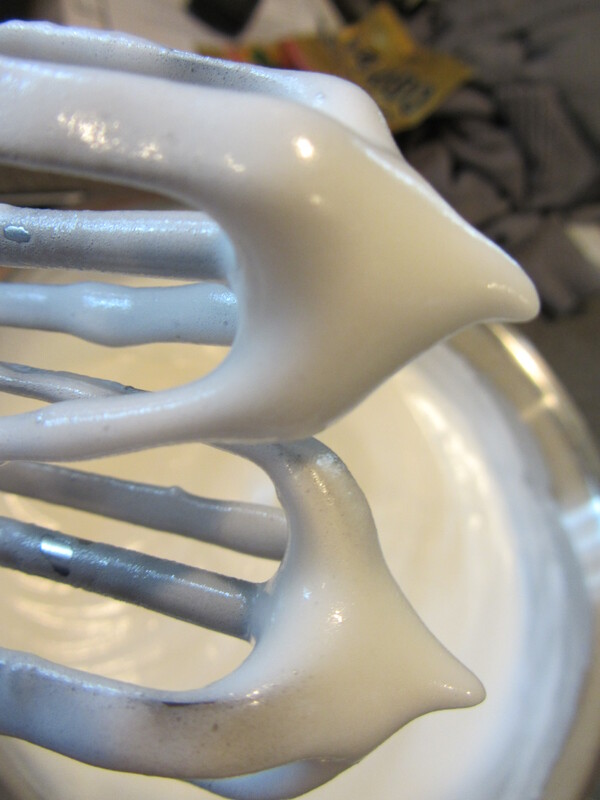 When your egg whites have soft peaks, decrease the speed on the mixer to avoid overbeating. Stop mixing when you have reached medium peaks. Whites after reaching medium peaks. Again, sift the flour mixture, but sift it over the top of the batter, just dusting the top. Dusting the top of the batter with sifted flour mixture. Use a spatula to gently fold the flour into the whites, just until not visible. Folding in the flour mixture. Repeat until all of the flour is incorporated. Gently spoon the batter into an ungreased tube pan and bake at 350 degrees for 35 minutes, or until a skewer comes out almost dry. My cake was ready after 35 minutes. The final batter, spooned into a tube pan. Cake after baking 35 minutes. Remove your cake from the oven and invert it on the back of a sheet pan. My cake pan has feet for this purpose. The cake needs to be inverted or it will collapse. Let the cake cool completely. Cake inverted to cool completely. 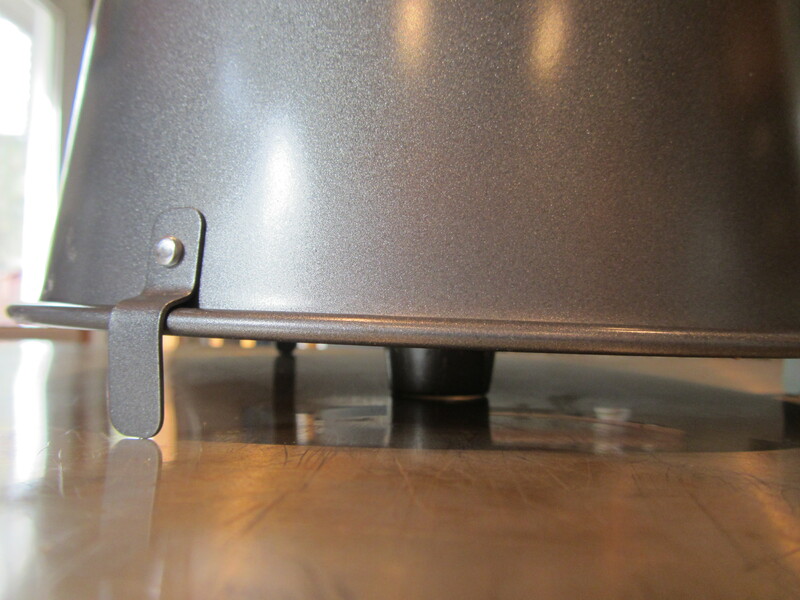 To remove the cake from the pan, you will need to run a knife around the edges, as the cake will be stuck from “climbing” the walls of the pan. While you certainly could serve your cake with accompaniments, we chose to eat ours plain. 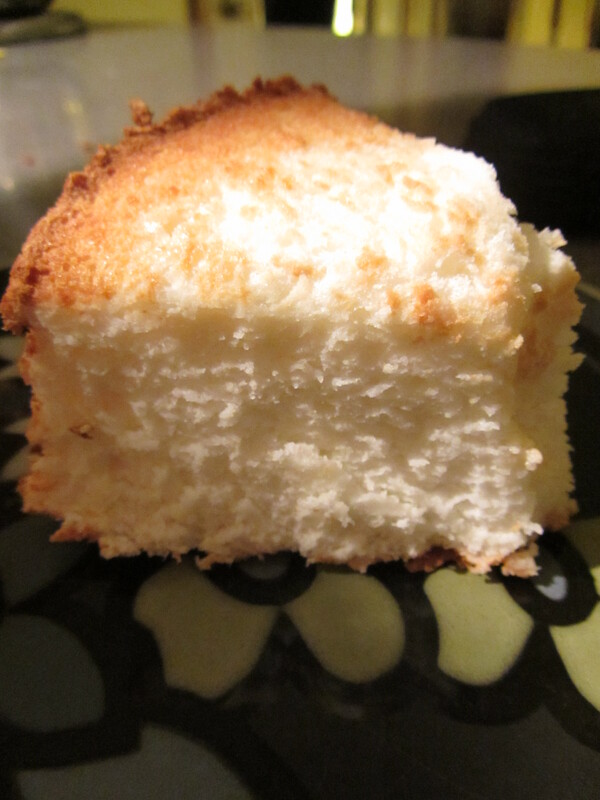 A slice of angel food cake. I have to say that Alton’s angel food cake is so much better than anything you can buy. It is moist, airy, and sweet, and has just the right hint of orange flavor. You could use any extract you would like to flavor your cake. While I still won’t be making angel food cake regularly, Alton’s version is quite delicious, and should I need an angel food cake in the future, this is the recipe I will use.